It also allows you to record all screen activities including onscreen changes, speech from microphone, mouse movements and clicks into highly compressed video files. You can choose to send captures to editor, file, clipboard, printer, email, Word / PowerPoint document or upload them to your website. Editing tools include annotating (texts, arrowed lines, highlights), resizing, cropping, sharpening, watermarking, applying edge effects and many more. Other features include image scanning, global hotkeys, automatic filename generation, support for external editors, a color picker, a screen magnifier and a screen ruler. The BB FlashBack Express free screen recorder has one-click upload to YouTube, Blip.tv, Viddler and Revver. Share your movie by sending a URL or embed it in a webpage. BB FlashBack screen recorder uses a number of different recording technologies to get the best from PCs old and new. Capture online events unattended with scheduled recording. Make notes at record-time and view them in playback. Record indefinitely and limit the file size by keeping only the last few minutes. A video is worth a thousand screen captures. A better product is My Screen Recorder. 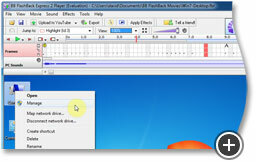 It is one of the best screen recording software. It records your screen and audio from the speakers or your voice from the microphone - or both simultaneously. The recordings are clear and look great when played back on your website or uploaded to YouTube. It will record directly to standard compressed format that works with any video editor or any tool, no conversion required.